We are teaching ourselves responsive design — very slowly — and put up a simple one-page, mini-site for one of the books, as we figure it all out! It is set up as a subdomain of our parent site, at kpagebrooke.insolentlad.com. Not linked up yet but we'll get around to it. Bit by bit, we should get more of our online presence into subdomains, including Arachis Press, as we feel our way. It may not be responsive at first; the mobile redirects we use now work well enough and we have more experience with the process, but eventually we should be mostly responsive. By that time, maybe we'll need to learn some other approach altogether! In other news, the print version of GOD OF RAIN (the new Mora fantasy novel by Stephen Brooke) has been approved and will be available pretty much everywhere by the target release date of March 13. We have copies coming from the printer for the occasion and should be getting the ebook versions up shortly. We are pleased to announce a release date of Monday, March 13, 2017, for the latest fantasy-adventure novel from Stephen Brooke, GOD OF RAIN. This is the first of a Mora trilogy, taking up where the three Malvern novels left off, and following the narratives of some of the secondary characters in those books. Hito had tired of war, of knowing he would never be more than the second to the hero Aranu. It was time he sought his own destiny, to leave fighting behind and seek more. Peace, he desired, and a wife and home. If a bit of wealth came his way, too, that was to the better. But was that what he truly sought? Should there not be more? From the Mora homeland to the jungled valley of the Gurang, from a new life as a trader to that of a Kohari prisoner, condemned to be sacrificed to the Sun Bird, his quest carries him. And does he find love, as well? Perhaps. In Teva, the God of Rain, must he seek who he is truly meant to be. 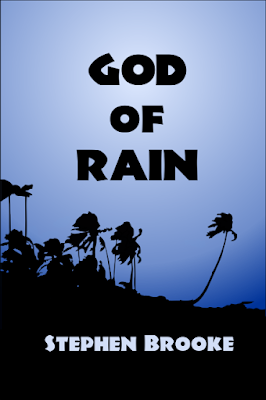 In the end, it will be Hito himself he finds, in the first novel of a new Mora Trilogy, GOD OF RAIN.